In New York City there are 10,000 people who never leave their homes because of failing health. 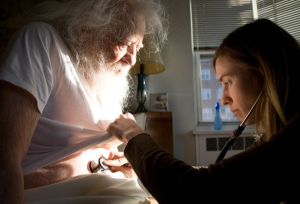 This film is an intimate portrait of one doctor who makes house calls, providing a lifeline for these frail individuals who otherwise would go without both primary care and urgently needed medical treatment. As we follow Dr. Ana Blohm into the homes and lives of her patients, we witness the healing power of human contact, which Dr. Blohm acknowledges may be more important than some of the medications she prescribes. Dr. Blohm is a member of The Mount Sinai Visiting Doctors Program. This program supplies hands-on, high quality medical care to over 1,000 homebound men and women. A model program for the delivery of medical care, the visiting doctors show that an old-fashioned practice is a viable modern solution.